Jacksonville is the largest city in the state of Florida by population and the largest city by area in the contiguous United States. There are more than 500 neighborhoods within Jacksonville's vast area. These include Downtown Jacksonville and its surrounding neighborhoods, including LaVilla, Brooklyn, Riverside and Avondale, Springfield, Eastside, and San Marco. Additionally, greater Jacksonville is traditionally divided into several amorphous areas, comprising large parts of Duval County. These are Northside, Westside, Southside, and Arlington, as well as the Jacksonville Beaches. 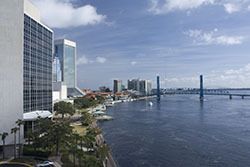 Jacksonville's location on the St. Johns River and the Atlantic Ocean proved providential in the growth of the city and its industry. Jacksonville has the largest deep-water port in the South (as well as the second-largest port on the U.S. East coast) and a leading port in the U.S. for automobile imports, as well as the leading transportation and distribution hub in the state.